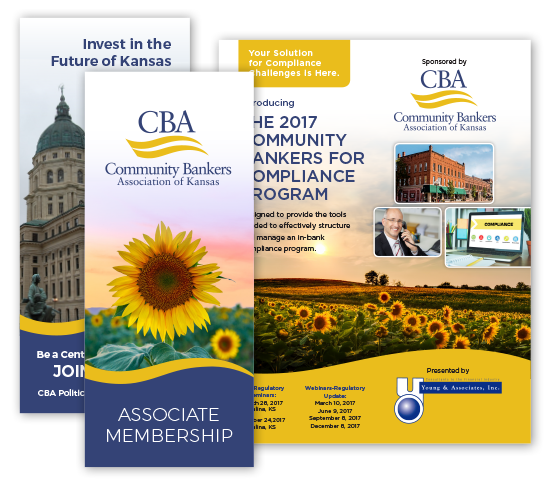 CBA is the only state level organization in Kansas working solely for the interests of community banks and their customers. Formed in 1978, CBA has met the challenges of a changing financial industry, emerging as an effective and committed voice for community banking in Kansas. Member banks are locally owned and operated, intent on preserving local credit for local development. CBA desires to serve every community bank in Kansas as a strong voice and a strong resource for the advocacy, networking, education and training that ultimately helps secure the longevity the state banking network in Kansas. By coming alongside community banks and helping them solve their unique challenges, CBA of Kansas helps community banks to be what they are intended to be. This means they can use their resources to serve local customers with effectiveness and authenticity. CBA desires to create a VALUE based marketing strategy and promote, promote, promote the distinct benefits membership offers to community banks in the state. CBA seeks to grow associate membership and vendors. CBA seeks to distinguish their services from other statewide or national organizations who do not offer the same level of personal, individualized resources. Community banks are consolidating and changing in terms of what they offer and how they perform in their regions. With an increase in membership levels, CBA has more strength to help maintain the success of local community banks. CBA is growing, and the organization is more involved in Kansas banking. It has a stronger emphasis on a “how can we help you” personality and remains relationship based — but lacks a clear enough differentiation to demonstrate its value. Overall perception of CBA of Kansas is positive, yet prospective members seem to lack a sense of urgency to join. SJC is working to engage audiences on a more personal level regarding the value CBA brings to community banks. This includes a new and customized set of literature, including a new Membership Packet; fundraising materials; annual convention materials; new compliance program materials; revised Community Bank Week packet; new letterhead and related materials and additional printed pieces that carry forward a more consistent brand image. New website: SJC merged an existing database platform with a new website that is easily edited by the CBA team. The new website focuses on the core message that CBA truly comes alongside community banks, listening to their challenges and providing relevant resources. New site tracking tools help identify where users are spending the most time on the site. The overall website experience now is easy to navigate but also demonstrates the positive and encouraging personality of CBA. Assistance with email marketing: SJC continues to help create a more streamlined email experience for CBA members.